I believe God loves those prayers. There’s never a wrong time to pray, though sadly it may be the only time He hears from some of us. Such a prayer might assume, however, that God wants us happy, comfortable, and satisfied. That’s perhaps partially true, especially in the ultimate sense. But the Bible talks at least as much about how important our discomfort is to God. 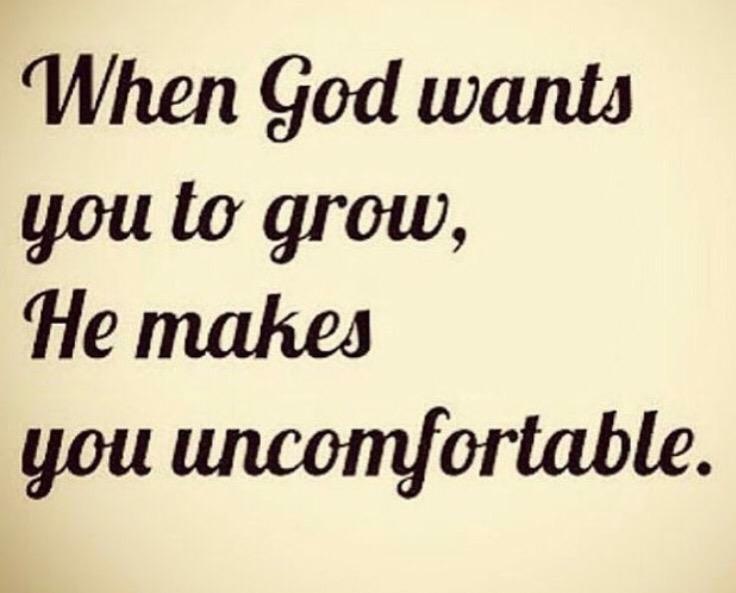 Sometimes God wants you uncomfortable. God created you for something much more than happiness, at least in the way we usually think about happiness. Our natural concept of our existence is much too shallow, much too tame, and much too comfortable. Think of a time in your life when you felt the worst. Perhaps you were depressed, or anxious, or lonely. If you’re like most people you probably wanted to stay in bed or veg out in front of the TV. From the outside you might have looked “comfortable,” but you were actually more than miserable. Now think of time when you felt most fully alive. It might have been when you created something beautiful, accomplished a major goal, or made a life-altering connection with someone. Perhaps you hiked to the top of a mountain and felt like you could see the whole world. The joy you experienced came as a result of taking a risk, pushing yourself beyond what you thought you could do, or giving of yourself extravagantly. It took something out of you, and the fulfillment you received in return was all the more valuable because of how uncomfortable you had been along the way. Jesus spoke often about the importance of our discomfort. In the Beatitudes He called people “Blessed” who are grieving, hungry or poor in spirit, or suffering persecution for His sake. (Matthew 5:1-12 ) You’re not going to be “hungry for righteousness sake” if you’re too comfortable. There were many times Jesus asked pointed questions or told stories that greatly disturbed some of those listening. Some people, especially the children or sick people, loved being around Jesus. Others, especially many of the leaders, couldn’t wait to get rid of Him. Jesus clearly made some people extremely uncomfortable. If you are experiencing a season of Divine Discontent, don’t constantly demand Rolaids for your “heartburn”. Pay attention to your burning heart, and listen to what God wants to say to you or do with you. Are you uncomfortable? Consider whether God may be behind it, and see where the warmth of your burning heart may take you. Your Turn: Are you uncomfortable? Do you think God might be behind it? What do you think He might be trying to get across to you in your burning heart?